The Los Angeles Rams have a roster weakness at linebacker. This was a known issue heading into the 2018 NFL Draft. Without top draft capital or much reason to address it with their selections in the middle of the draft, the Rams still maintain a similar roster weakness as we get ready for Phase III of the offseason program a week from today. So with a couple of pieces out looking at that roster need, I think the appropriate reaction should be pretty muted. Sure, the Rams’ roster weakness is obvious, but only because the strength elsewhere is so, so, so strong. And it’s the same weakness it was a year ago. With the upgrades at cornerback and on the D-line, it’s perhaps a weakness with less need to address than a year ago. The downside to all that talent coming in is that the Rams didn’t really have the opportunity to fix any more needs in the draft. With Robert Quinn in Miami and Connor Barwin still unsigned, the Rams’ leading returning edge rusher is Matt Longacre, with just 15.5 pressures last season according to Sports Info Solutions charting (subscription required). Longacre’s really more of a rotational piece, someone who slides in and provides solid play while your actual weapons get some rest on the sideline. He’ll be joined by last year’s fourth-round pick, Samson Ebukam, and this year’s fifth-round pick, Ogbonnia Okoronkwo, as Wade Phillips tries to turn top-tier athletic traits into on-field production. 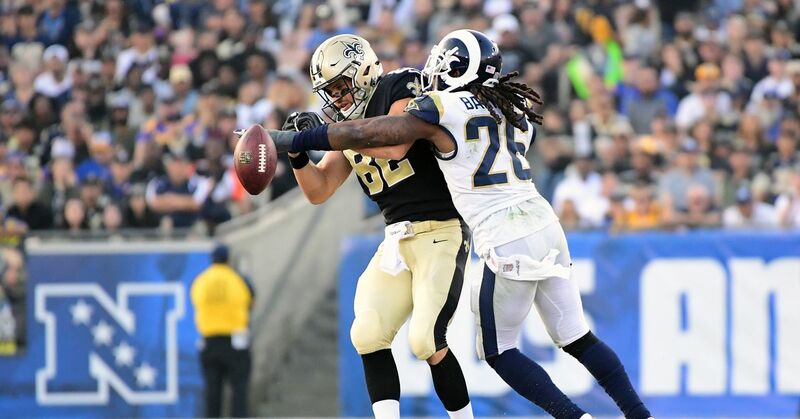 It’s actually not that bad of a group; it just pales in comparison to the All-Star squad Los Angeles has built on the defensive line and in the secondary. Lost in the good feeling of the Rams’ 2017 revival was the fact their run defense was one of the league’s worst. Los Angeles gave up 4.7 yards per carry thanks to a depleted linebacker corps, and didn’t add much help this offseason. Joining Mark Barron, Matt Longacre, Samson Ebukam, and Bryce Hager will be the $705,000 signing of Ramik Wilson and fifth-round draft pick Micah Kiser. That’s going to put a lot of pressure on a dynamite defensive line that added Ndamukong Suh to disrupt blockers up front. So yeah. The Rams’ linebacking unit isn’t great. But it wasn’t great in 2017. Instead, the Rams have cut down the cost of the unit substantially while offering some upside from some young projects for Rams Defensive Coordinator Wade Phillips. No, the Rams don’t necessarily have to start any of their new rookie linebackers. But consider a three-man linebacking formation compared to last year’s lineup. Is Longacre really a huge downgrade from Barwin? And while none of the options might be as individually as talented as Quinn, it’s not as if he was a quantity the Rams couldn’t be without (hence why they are now without him). As for Alec Ogletree, upgrading the run defense among the linebackers was perhaps a primary effect of his individual skill set. He was fantastic in blitz packages which might be something a rookie could latch onto the 53-man roster by showing a proficiency in, though perhaps that’s Cory Littleton’s role to own. If you go through those two pieces and look at other teams’ roster weaknesses, they’re need much, much, much, much more than the Rams need linebacking talent in 2018. And that’s just an outcome we can be thankful for given how good the team looks on paper in mid-May with expectations higher for this team than they have been in about 15 years.